More than 100 highlights of downtown Chicago, from Michigan Avenue to the riverfront to the Loop. 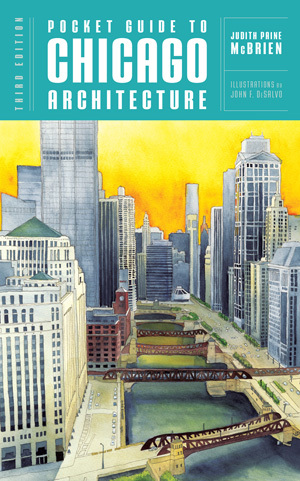 Updated and expanded to chart Chicago’s evolving urban landscape, the third edition of this popular handbook is the perfect companion for self-guided walking tours, as well as an excellent source of information for those wishing to explore the internationally acclaimed architecture of Chicago. Over 100 highlights of the downtown area are covered, with accompanying maps, a glossary of architectural terms, and an index of architects and buildings designed to orient the reader along architectural routes from Michigan Avenue to the Riverfront to the Loop. Also included in this third edition is a fourth section highlighting the city’s diverse campus architecture, from work by Mies van der Rohe and Rem Koolhaas at the Illinois Institute of Technology to the Hyde Park neighborhood of the University of Chicago, where Frank Lloyd Wright’s Robie House stands.